Every issue we bring you original material from some of the best columnists, educators and cutting-edge researchers. Subscribe here. “Contents,” Wilmott, vol. 2018, iss. 98, p. 1–1, 2018. D. Tudball, “Another nickel in that there machine,” Wilmott, vol. 2018, iss. 98, p. 2–3, 2018. “News,” Wilmott, vol. 2018, iss. 98, p. 4–9, 2018. A. Brown, “The bull case for cryptocurrencies,” Wilmott, vol. 2018, iss. 98, p. 10–13, 2018. S. Das, “Financialization and its discontents,” Wilmott, vol. 2018, iss. 98, p. 14–21, 2018. R. Bogni, “The economics of migration,” Wilmott, vol. 2018, iss. 98, p. 22–23, 2018. T. Guida and G. Coqueret, “Machine learning in systematic equity allocation: a model comparison,” Wilmott, vol. 2018, iss. 98, p. 24–33, 2018. U. Wystup, “How can a 50/50 bet have odds of 1:2 instead of 1:1?,” Wilmott, vol. 2018, iss. 98, p. 34–35, 2018. R. Poulsen, “This is not sparta: a joint effort,” Wilmott, vol. 2018, iss. 98, p. 36–39, 2018. L. MacLean, B. Ziemba, and A. Korgan, “The expected utility of performance: dominant batting seasons in baseball,” Wilmott, vol. 2018, iss. 98, p. 40–43, 2018. P. S. Hagan, A. S. Lesniewski, and D. E. Woodward, “Implied volatility formulas for heston models,” Wilmott, vol. 2018, iss. 98, p. 44–57, 2018. J. Riposo, “Some spectral asset management methods,” Wilmott, vol. 2018, iss. 98, p. 58–69, 2018. M. Radley, “Cars,” Wilmott, vol. 2018, iss. 98, p. 70–71, 2018. J. Darasz, “The skewed world of jan darasz,” Wilmott, vol. 2018, iss. 98, p. 72–72, 2018. 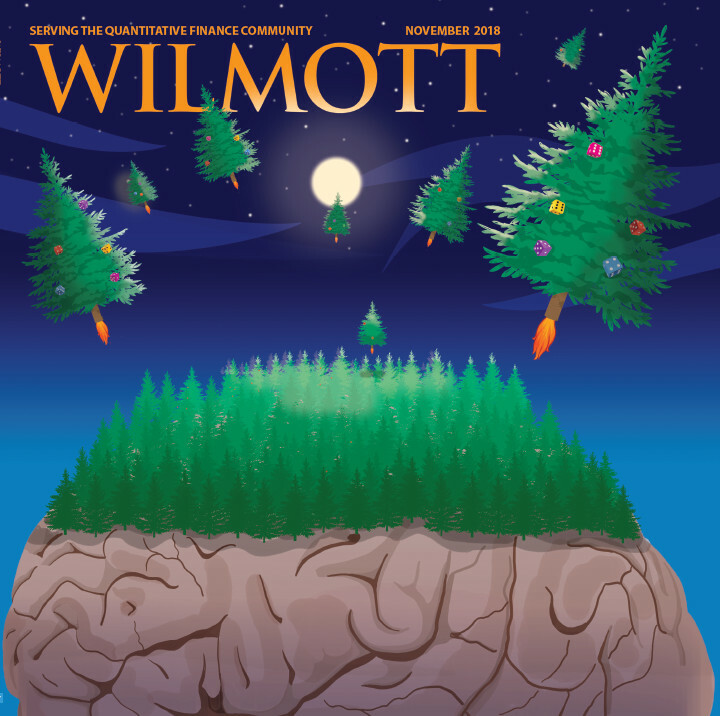 More information about Wilmott magazine, for potential subscribers and submission of articles and research papers, can be found here.